This tale comes to us from Germany, and was collected by the Brothers Grimm. I've taken some liberties with it, adding, if you will, a few modern aspects to the wooing and the "happily ever after." I didn't want to tinker with it too much but felt compelled to make a slight alteration (in the original version, the spindle, shuttle, and needle become relics, locked in the treasury - honoured but unused, which I thought was a shame). In the historical context, of course, it meant that the poor young woman's fortune had changed and she would never have to work again. Since this is a sewing blog, I put a bit more emphasis on her love of sewing and weaving, and gave her tools their due in the end. Once upon a time there was a young woman who had been orphaned when she was very little. She lived with her godmother, in a little brown cottage on the outskirts of the village. Her godmother earned her living with spinning, weaving, and sewing, which she taught the young girl, who soon became as skilled in her craft as she. When the girl was fifteen years old, her godmother took ill, called the child to her bedside, and said, "My dear daughter, I must leave you soon. I leave to you this little brown cottage, that will protect you from wind, rain, and snow; and also a spindle, a shuttle, and a needle, with which you can earn your living." She then laid her hands on the girl's head and blessed her, saying, "Keep God in your heart, and it will go well with you." She soon closed her eyes and drifted off into her final rest. The years passed, and the young woman took comfort in her spinning, weaving, and sewing; all of which seemed touched by her godmother's blessing. There was always an abundance of flax in her stores, and every piece of cloth she wove, yarn she spun, or garment she made was admired and paid for handsomely. Due to her skill and the joy she took in her crafts, she was never in need, and always able to share with her neighbours. At this time the King's son was traveling throughout the country in search of a bride. His father wanted him to marry a wealthy member of the court, but the King's son was a thoughtful young man, who cared not whether his future wife was rich or poor, but wanted in a wife only someone to love who would love him in return. Since he did not find love amongst the ladies of his father's court, he set off on horseback one day, saying, "My wife shall be the girl who is at the same time the poorest and the richest." When he came to the village where the girl lived he asked, as he had done throughout the countryside, who was the richest girl and the poorest girl. The villagers named for him the richest girl, and then said that the poorest girl was the one who lived in the little brown cottage just outside of the village. The rich girl sat in her doorway in all her finery, and when the Prince approached she bowed before him. He looked at her, said not a word, and rode on. When he arrived at the poor girl's little brown cottage she was not standing in the doorway but instead was sitting at her spinning wheel and diligently spinning. She looked up, and when she saw the prince looking in she blushed all over, closed her eyes, and continued to spin. She had heard how kind and thoughtful he was, and of his bravery and good deeds, but he was also very handsome and all these things combined in her mind to great effect: Her heart beat quickly, and the yarn was uneven in places but she continued to spin until the Prince had ridden nearly past her window. He smiled and wished her good morning, then continued on, thinking that she had not been interested in him. And lead the Prince back to my house." The spindle immediately jumped out of her hand and bounded out the door. Amazed, she stood up and watched it as it danced merrily across the field, pulling along a glistening golden thread behind it. Before long it had disappeared from her eyes. Because the girl no longer had a spindle, she picked up her shuttle, sat down at her loom, and began to weave. Now the spindle danced ever onward, and just as the thread came to an end it reached the Prince. "What is this?" he cried. The golden thread glistened in the sun. Intrigued, he turned his horse around and followed the golden thread back down the road. Illustration by Elizabeth MacKinstry from The Fairy Ring by Kate Douglas Wiggin & Nora Archibald Smith 1906. New York: McClure, Phillips & Co.
a pathway to this house of mine." Just then, the shuttle jumped from her hand and skipped out the door, weaving a carpet before the threshold more beautiful than anyone had ever seen before. Its borders were made up of every type of flower in vibrant hues. In its middle, against a golden background, there were rows of green upon which does, hares, and lambs were jumping about. In between, stags and deer stuck out their heads. Birds in rich colours sat above in the sun-dappled leafy branches. The shuttle continued to jump back and forth, with the dazzling carpet springing up behind it. Prepare this house for the suitor of mine." Then the needle jumped out of her fingers and flew about in the cottage with blinding speed. The table and benches were soon covered with rich, kelly green cloth, the chairs with deep blue velvet; and silk curtains hung at the windows. The needle had scarcely made its last stitch when the girl looked through the window and saw the white feathers on the Prince's hat. The spindle had brought him here with its golden thread. He dismounted, amazed at the resplendent carpet that led to the threshold of the little brown cottage. When he stepped into the kitchen she was standing there in her simple dress, but she was glowing in it like a rose in a bush. "You are the poorest, but also the richest," he said to her, bowing. "Come with me, if you will, and you shall be my bride." She reached out her hand to him, which he took gently, looking into her eyes and smiling again. He led her outside, lifted her onto his horse, and took her to the Royal Palace where very soon afterward, their wedding was celebrated with great joy by royalty and commoners alike. Although now a Princess, the young woman continued to take joy in her crafts, and the spindle, shuttle, and needle became treasures of the Royal Household; honoured for their role in bringing the young couple together and the lush fabrics they helped to create. The Royal Couple became known for their generosity and happiness, and their palace was the most colourful and luxuriously decorated court in the history of the land. The richness of the decorations, clothing, and cloth woven in the palace is still spoken of to this day. Grimm, J. and W., 1857. Spindel, Weberschiffchen, und Nadel. Kinder- und Hausmärchen (Children's and Household Tales -- Grimms' Fairy Tales), 7th ed. no. 188. Göttingen: Verlag der Dieterichschen Buchhandlung. Wiggin, K. D. & Archibald Smith, N. 1906. The Fairy Ring. New York: McClure, Phillips & Co. I like your ending! Thanks for sharing. I'm glad you like it, Caroline. Thanks for reading! I like it and the ending is perfect!!! Your story made me smile truly! You obviously have found your own richest Princess...it shows in the lovely way you ended your sweet tale.All my best to both of you!Thank you! Wonderful adaptation! Beautiful story! Thanks again for sharing! I LOVE this story and I especially like the ending now :-) Thank you sweetie! Oh, yes, Amber. That I have. Many thanks! I'm glad you enjoyed it. Yay! I remember this tale from a schoolbook that belonged to my grandfather, "Heart of Oak." I think. Or maybe I'm thinking of Diamonds and Toads ... thanks for this lovely re-telling, Mr. David, sir. "Heart of Oak" had a poem in it, "The Retired Cat" by William Cowper that I liked as a child - thank you for reminding me of it. Diamonds and Toads is a fun story, which I'd forgotten as well. I'll have to look for them both. It's great to rediscover these tales, and I'm enjoying this side project. I really appreciate everyone's kind support and feedback. That was wonderful and uplifting! Would that every story about people who work hard with their hands were so joyous. 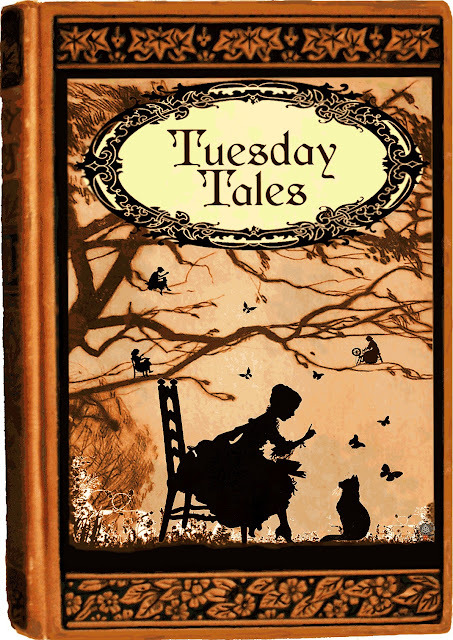 I am really enjoying Tuesday Tales. I love the sound of that magnificent carpet! Thank you! That makes me very happy. Yes, I enjoyed writing that bit, trying my best to see the colours and imagery, then trying to describe it - a fun exercise. I threw the lambs in because Debi and I used to live in the Fife countryside, and loved going to the pastures during lambing season. There was a grazing field very near our house where we'd just watch them bound up and down the hillside, bleating all the way.